So Hindus (and Sikhs, Jains and Buddhists) are still gullible. They consider it a privilege and status symbol to be invited by the Pope. This is akin to a lion (actually a cunning fox in this case) inviting a lamb for the dinner where the lamb does not know that it is the main course! Remember the Pancatantra story of the monkey who was being lured by the crocodile to satisfy his wife’s craving for a monkey liver? of course, he was smarter than current crop of Hindu leaders. I would love to see names of these Hindu “leaders” so that we can expose and shame them. 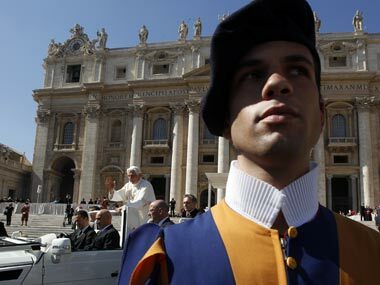 London: Over 200 spiritual leaders, including Hindus, Muslims, Jains, Sikhs and Buddhists, will attend a multi-faith meeting being hosted by Pope Benedict XVI on 27 October in Vatican to promote world peace. Pope Benedict XVI is hosting the multi-faith meeting in favour of world peace, which was started by his predecessor Pope John Paul II, the Vatican said in a statement today. The spiritual leaders invited are from Hindus, Buddhists, Muslims, Sikhs, Confucianists, Baha’i, Jains, Jews, Taoists and Zoroastrians, it said. Among the Hindu invitees are Mahatma Gandhi’s grandson Rajmohan Gandhi, who has already participated in an earlier meeting. Three Jains, five Sikhs and 67 Buddhists leaders are in the list of invitees. Around 70 Muslim leaders, including from Iran and Saudi Arabia, will also be present on the occasion, said Cardinal Peter Kodwo Appiah Turkson, chief of the Vatican’s Pontifical Council for Justice and Peace. The meeting would call for “a common path” to peace, he said, adding the participants will pray in silence during a short procession to the basilica of Assisi and in separate rooms after the ceremony. However, the Grand Imam of the Egypt-based influential Al-Azhar mosque has called for a boycott of the conference since the pope expressed solidarity with Egyptian Copts following a New Year’s bomb attack on them. The event will also mark the 25th anniversary of the historic multi-faith meeting held in Assisi on 27 October 1986 by Pope John Paul II.